We returned to Addis Ababa to check on the lines of yeast being propagated under laboratory conditions. The yeast will be used in the production of Ethiopia’s distinct honey mead, known as tej. Those who participated in the project to produce the honey mead proclaim it is their goal to bring tej to a level of prestige. Once reserved for the elite, tej is now enjoyed by many. This trip to Ethiopia has been quite an experience. I met many people interested in our projects centered in Bonga, Ethiopia in the highland organic honey region. A food scientist discussed organic crops and the role of honey bees in pollination and food production. 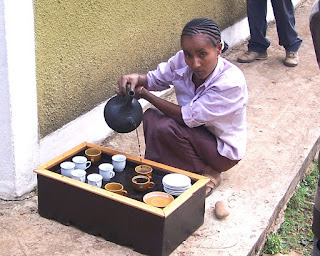 Several Ethiopians shared passed-down knowledge of tej making. Abraham Tesfaye explained the microbiology of yeast propagation. Hafez Anwar explained how foreign countries are helping build Ethiopia’s infrastructure with large projects like his road construction. 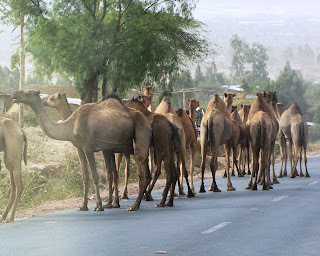 I asked, “How can Ethiopia progress to a six-lane superhighway carrying trucks to Djibouti’s sea port when the road cuts through pedestrian neighborhoods blocking foot traffic and even livestock herding?” Students and businessmen listened intently to details of the bee hive projects I assisted Apinec develop. I spent hours with my host Wubishet Adugna, often over bereles of tej, sharing thoughts on beekeeping and ways to provide opportunities for the Ethiopian people by harvesting the honey bees’ products derived from the diverse forest bounty. I got an opportunity to share wonderful food, music, and other riches of Ethiopian life. I saw resourceful people who never complained no matter how adverse the situation. They were always helpful, friendly, and eager to laugh with me. I had a most memorable visit to Ethiopia. While the climate of the Ethiopian highlands is moderated by their altitude, the low elevation and proximity to the equator makes this rift area quite hot and dry. The Rift, eastern Ethiopia, and much of the Horn of Africa is now in its third year of severe drought which coincides with a particularly strong La Nina event described as a cooling of the surface waters of the central and eastern Pacific Ocean. While some individuals in parts of the world deny the existence of global warming or climate change, those who live in the Great Rift Valley understand climate destabilization. Pastoralists of eastern Ethiopia and the Great Rift Valley see their livestock stressed by dried-up pasture grasses. Herdsmen carry their livestock great distances to rivers for water. Projections are for continued drought in this arid region as well as in Ethiopia’s poorest area, the Southern Nations, Nationalities, and People’s Region. Worldwide, climate destabilization moves the weather toward the extremes. An English language article in Addis Ababa’s Daily Monitor datelined Nairobi, Kenya outlines proposals for correcting the effect of human-generated greenhouse gasses such as water vapor, carbon dioxide, and methane released by the burning of coal, oil, and natural gas. Technologies used around the world to alleviate greenhouse gasses are classified as Carbon Dioxide Removal and Solar Radiation Management. Reforestation and avoidance of deforestation help by absorbing carbon dioxide. Large portions of Ethiopia’s forests have been cleared for farmland. Climate disturbance tends to affect those already experiencing the harshest of conditions. Today’s photo: dromedary camels in Ethiopia’s Great Rift Valley. Ten neatly dressed women sitting in the shade of a spreading ficus tree appear to be conducting an important meeting. My Ethiopian contact explains that I am witnessing a Social Court, a structure that exists in rural Ethiopia where a police or governmental presence is rarely seen. Community leaders convene a Social Court to settle domestic disputes or community complaints. A person found guilty by his community may be fined, forced to perform work, or shunned, a harsh penalty in a close-knit interdependent community. Social Courts are an effective control over the behavior of rural citizens. They hold the community together and give offenders a real understanding of the group’s expectations. Examples of social bonding abound in Ethiopia. A strong example is the Ethiopian tradition of family, friends, and invited guests sharing the same food from a common serving—and eating by hand. 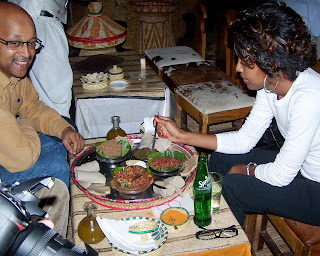 The meal of meat or vegetables is placed on a thin sheet of fermented bread, known as injera. Those sharing the meal tear off pieces of injera to scoop up bites of food. Social customs in Ethiopia build bonds between friends as well as between those meeting for the first time. Ethiopians always stand, shake hands, and acknowledge everyone in the room. However, if a person is sick or his hands are not clean, he offers the wrist as a handshake. In the Ethiopian countryside, one sees the close bond that Ethiopians have with their animals. When young boys herd the family’s animals, they mind their owners like well-trained dogs. Beasts of burden carry bundles of goods along roads ahead of their owners who follow on foot. Animals and people sleep together inside small huts for protection from predators. Quite a few Ethiopian families maintain a bond with their honey bees, mounting their hives under the low-hanging thatch roofs of the family’s hut. Children play among the flying honey bees. People, livestock, and honey bees live in close proximity. Wubishet Adugna and I share bereles of tej. 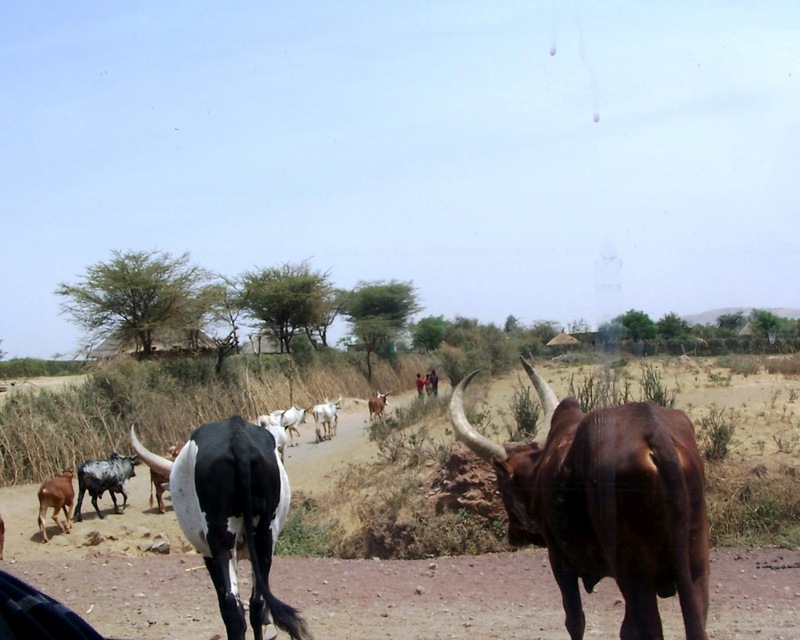 As we traveled northward, the forests thinned and farms abounded in Ethiopia’s open plains. As we left the forests, we encountered less monkeys and baboons on the road, but larger herds of livestock. Our truck stopped repeatedly for cattle being driven to water in the rivers. Crossing the Omo River gorge, we encountered numerous volcanoes. Today’s photo shows a typical farm with a thatched roof, stick and mud daub house located near the base of a volcano. The entire family shares the single-room house with cattle, sheep, goats, and donkeys. Young boys direct the cattle herd’s movements with a stick like a conductor directing an orchestra. The cattle obey their master with whom they live night and day. Stacks of teff recently harvested by hand with a short sickle sit on the ground. Family members, including children, toss the teff into the air to separate the fine seed. Teff is the staple crop used to make the fermented bread known as injera that is eaten at every meal. 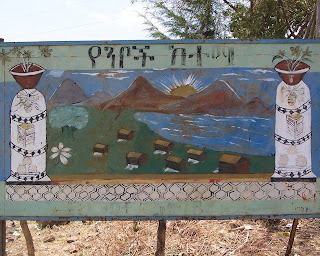 As we continued on our drive to Nazareth, Wubishet and I discussed how Ethiopia’s honey bees tend to abscond, or abandon their hives, much more frequently than do the honey bees of beekeepers in the more temperate climate of the United States. Wubishet described seasonal management of the hives in which beekeepers increase the volume of the hives prior to major nectar flows to accommodate the colonies’ honey storage capacity. I explained that some believe that tropical bees, like those in Ethiopia, don’t hoard honey, but instead abscond and move to the mountains during the dry season. Wubishet said that that description of tropical bee behavior is not correct. I told him that honey bees will abscond if their hive becomes completely undesirable. He explained that at times the comb melts in the equatorial heat, truly making for an unfit nest. We stopped at Walesa for a meal of traditional fasting food: injera with an assortment of beans, peas, lentils, and peppers. Wubishet and I brought an empty drum from Bonga to the fuel depot at Jimma, but Jimma was experiencing a shortage of fuel. An angry encounter at the fuel depot was the only time I heard voices raised my entire time in Ethiopia. Many trucks converged on the fuel depot, and the operators would not pump any extra fuel. They did, however, allow us to fill our truck’s fuel tank with diesel. A guard with an automatic rifle ensured no actions exceeded the raising of voices. After a final cup of Jimma’s famous Kaffa Zone forest coffee, we started the long and beautiful drive to Nazareth. Wubishet Adugna, an accomplished beekeeper and businessman, taught beekeeping skills to 2000 farmers who supply honey and beeswax to Apinec. As we made the long trip by truck from Jimma to Nazareth, we discussed honey bee health and compared beekeeping techniques between Ethiopia and the United States. In the Kaffa Zone, we encountered many traditional bee hives hanging high in trees I spotted a dark mass 50 feet up a tree and adjacent to traditional bee hives. I asked Wubishet if that might be exposed honeycomb or a swarm. He explained that it was a colony of small ants, locally called “enni.” These ants fight larger ants living in the ground, and ants are considered Ethiopia’s greatest honey bee pest. Ethiopia doesn’t have Varroa mites, America’s most deadly pest. Ethiopia doesn’t allow the importation of bees or items which might bring in Varroa. Ethiopia has lesser trade in shipping containers and no sea harbors. Discussing bees, Wubishet explained that he resents the image presented of African “killer bees.” We visited a farm house with traditional bee hives attached to the walls under the thatched roof eaves. Children regularly played around the hives. We saw honey bees and humans living together in harmony. 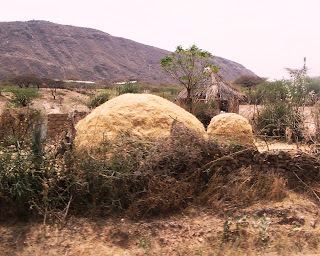 The photo shows the stick and mud daub construction of a typical Ethiopian farm house protecting humans and domestic animals from predators. I said good bye to the students at Apinec. In the few days that I was with them I shared information about producing products from the bee hive, and together we created a procedure for making tej, the Ethiopian honey mead. I also answered quite a few questions about America. There were numerous questions about “red-skinned” American Indians and American family customs, especially the role of females in our society. Many wanted to know about the prospects for the reelection of President Barak Obama. The citizens of remote Bonga, Ethiopia were versed in American political issues at great depth and understanding. The men each gave me a warm Ethiopian handshake, shoulder bump, and hug. They were all amused when I gave the one female in the group an American hug. Wubishet Adugna and I headed for Jimma by truck. 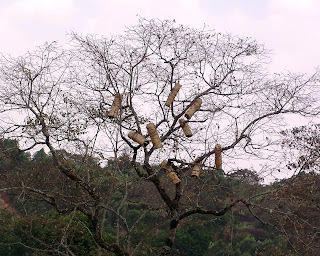 As we travelled the dusty road through the Kaffa Zone, we observed numerous traditional hives hanging high in trees. The hives are a beautiful sight on the Ethiopian highland ridges adorning tall Cordia africana trees, “weyra” in Amharic. We stopped at the home of beekeeper Abeba Rausha who showed me the bees he keeps in modern bee hives, modified Zander hives. Most modern bee hives in Ethiopia are painted yellow. Forest coffee beans dried in the sun on the ground in front of Abeba’s bee hives. Abeba served us fresh bread that his wife had baked along with valonia honey and coffee. This was indeed a delicious and memorable meal shared on the porch of Abeba’s home. Abeba manages 175 bee hives with some modern hives and many traditional hives. White blossoms of valonia, a low tree of 20 to 30 feet covered the southwestern Ethiopia highlands. 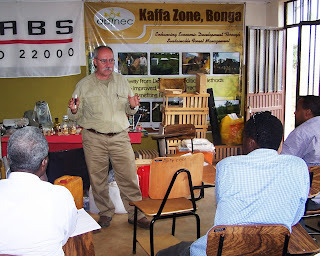 The Kaffa Zone is the heart of the organic forest honey and coffee region. The word “coffee” comes from Kaffa. The coffee tree is thought to have been discovered here and taken from the Kaffa zone to be replanted in equatorial regions around the world. I considered the training sessions at Bonga to be a success. In an effort to expand upon the Ethiopian beekeepers’ sources of income, I demonstrated methods to producing cosmetic products from the available beeswax and honey. The processors at Apinec made nicely finished lip glosses, hand creams, and restorative skin care products, adding Ethiopia’s cocoa butter, olive oil, sesame oil, Ethiopian spices, and the essential oils of frankincense, citronella, palmarosa, and eucalyptus. Apinec’s spices included Ethiopian cardamom and wild pepper. The processors’ tej honey mead production was quite successful using the Kaffa Zone’s organic forest honey and native plants to recreate Ethiopia’s traditional honey wine. 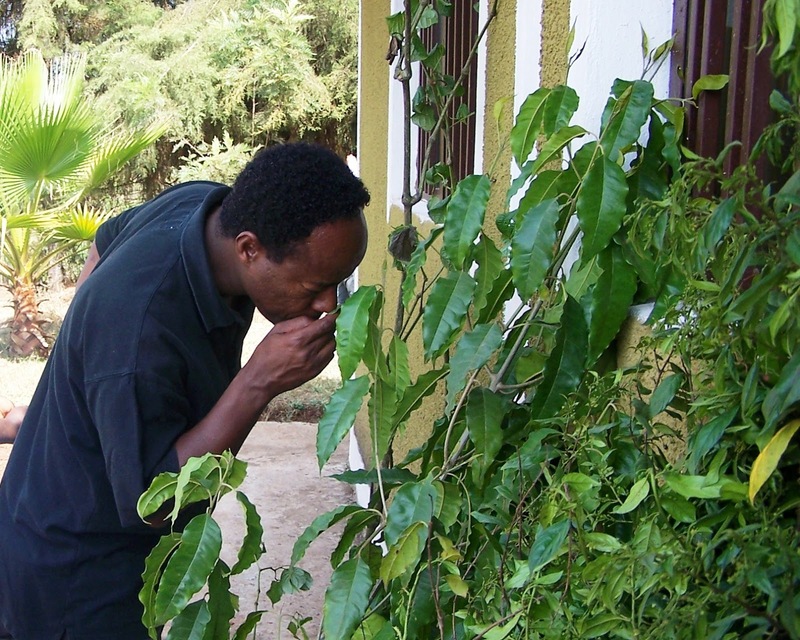 Microbiologist Abraham Tesfaye joined in the tej production effort to ensure that our procedures consistently produced a tej in a traditional manner while preventing contamination of our yeast cultures. To ensure consistency of the tej production over numerous batches, Abraham started propagating our lines of yeast in laboratory conditions. He explained that the yeast cell division occurs under aerobic conditions. Abraham assisted by directing the production of tej in anaerobic conditions to enable the yeast to convert the carbohydrate of the honey to alcohol. Complete filling of the fermentation vessels and the use of fermentation air locks that processor Fasika Habtemariam built ensured the proper conditions existed. The honey used to produce the tej is the forest honey collected from traditional bee hives. The honey is derived by crushing the honeycomb by hand, which leaves significant amounts of pollen and brood in the honey. The pollen and brood are sources of protein necessary for yeast cell development. Protein makes this raw forest honey an excellent medium for yeast cell growth and fermentation. Twice a day during our training sessions, Apinec’s Tigist Wildemichael roasted, ground, and brewed Bonga coffee in a jebena and served it to us along with roasted barley or chickpeas. Many a Kaffa Zone thatch-roof house sports a jebena coffee pot atop the center pole of the roof, the house’s only adornment. On the second day of our training sessions in Bonga, Ethiopia, the students arrived with bundles of foliage that they harvested in the surrounding forest. The bundles contained aromatic plants used to make Ethiopia’s traditional honey mead, tej. 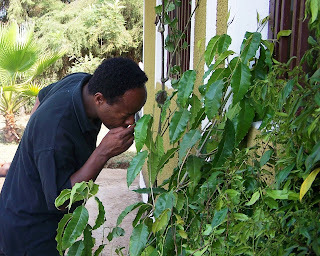 In today’s photo, my host, Apinec Agro-Industry’s Managing Director Wubishet Adugna, checks the fragrance of the broad leaves of wild pepper. The center plant in the bundle, with small leaves, is limich; and the plant to the right is gesho. The people of the Ethiopian highlands are adept at finding and harvesting the rich plant life of the forest. The wild pepper will be burned along with Olea africana to produce a sterilizing smoke for the vessels holding the tej. The smoke also imparts some of the distinctive flavor to this traditional mead. When I bruised the leaves of the limich plant, Clausenia anisata, I immediately recognized the bright, pleasant odor. It is the odor of honey bee Nasanov pheromone! Worker honey bees raise their abdomens and use their wings to fan air across their Nasanov glands to direct flying bees back to the hive. Nasanov pheromone helps organize bees while they are swarming, and worker bees fan Nasanov pheromone while their virgin queen is making her mating flights. Scout bees use Nasanov pheromone to mark the location of food sources including favorable sources of water. Nasanov pheromone is of great importance for communications within the honey bee colony. A plant-based substitute would be of great use to beekeepers. I quickly learned that limich is well founded in Ethiopian indigenous knowledge of beekeeping, as it is used to attract swarms to traditional bee hives placed high in trees. Limich is commonly used in Ethiopia to bathe mothers after they give birth. Essential oils of the plant are used to treat a number of ailments of humans and cattle. The gesho plant is used to give tej its distinctive flavor. The bitter gesho stems and bark counter the sweetness of the honey. Mead, or honey wine, considered our oldest alcoholic beverage, is produced by fermenting honey diluted with water. There is no single formula for mead, and it is made in many styles and flavors. Most mead recipes include a fruit or spice added to balance or contrast with the sweetness of honey. Some of the fruits added to mead include tart apples, citrus fruits, and raisins. Cloves, nutmeg, and cinnamon are spices commonly used in making mead. Yeast, which provides the fermentation, for mead may be added by the mead maker or it may be derived from “wild” yeast existing in the air or on the surface of fruit. 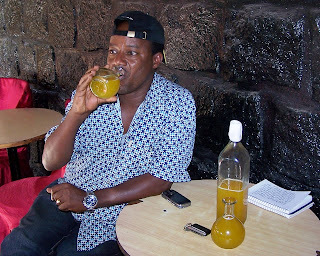 While mead is made and enjoyed throughout the world, Ethiopia has its own traditional honey wine known as tej, which is produced from three ingredients: honey, water, and gesho. Gesho is the native Ethiopian shiny-leaf buckthorn, Rhamnus prinoides. The stems and bark of gesho are used to counter the sweetness of honey in tej. The production of tej is an art passed as indigenous knowledge across generations over thousands of years. The unrecorded oral tradition of tej-making has been lost in some locations. At Apinec in Bonga, we recreated the process of making tej using traditional materials and techniques along with modern production methods. A microbiologist joined us in producing tej. While we used modern techniques for sterilizing containers and equipment, we also burned Olea africana and wild pepper, two plants smoked in traditional tej making to sterilize containers. While modern sterilizing methods are effective, traditional tej receives some of its distinctive flavor from the smoke. Once a drink of nobility, tej is now enjoyed by many Ethiopians. It is usually served at room temperature in round flasks called bereles. This tej is cloudy in appearance. The processors at Bonga are experimenting with techniques to produce a clear golden, effervescent tej. Today’s photo shows bereles of tej served with a traditional meal of wot, rolls of injera, and squares of false banana enset. Bonga, Kaffa Zone, Southern Nations, Nationalities, and People’s Region, Ethiopia is in the heart of the organic forest honey and coffee region. Located in the highlands at seven degrees north latitude, the region produces ample amounts of product from the surrounding forests. Apinec Agro-Industry purchases raw, hand-crushed honey and beeswax from two thousand area farmers. They process and pack honey and beeswax along with coffee and spices for export. Apinec requested that I train their employees to produce additional products from the honey, beeswax, and propolis collected from the Kaffa bee hives. I conducted a series of training sessions similar to those conducted by the Tennessee Beekeepers Association across the state of Tennessee. In both cases the purpose was the same: to make beekeeping more sustainable by expanding the number of products available for sale. Numerous products can be produced based upon beeswax and honey. Through an Amharic language interpreter, I demonstrated how to produce beeswax candles, hand and skin lotions, lip glosses, and other cosmetic products. A student repeated the steps to verify accurate translation and understanding. Having a rich supply of vegetable oils, spices, and essential oils, Ethiopia is well suited for producing such products. I also provided the Apinec processors with formulas and procedures to produce other products from leather conditioners to furniture polish. The technology for producing each of the products is relatively simple, so start-up of manufacturing products should begin fairly soon. The first attempts by the student processors resulted in very presentable packaged products. The appearance, texture, and fragrance were very nice. To get some feedback on the appeal of the products, we gave samples to five ladies. Each of the five reported that they were not comfortable with the feel of the product on their lips. This proved to be an important marketing test of the product, which will now be reformulated with beeswax and other Ethiopian oils. Apinec’s venture into producing other products from the bee hive is a first for Ethiopia. Agriculture and beekeeping contrast starkly from the United States to Ethiopia. America’s food production is now accomplished by a small fraction of the population, while almost all Ethiopians are farmers. Even though beekeeping and the pollination it provides is responsible for one third of our food production, an extremely small group of people manage our bees. 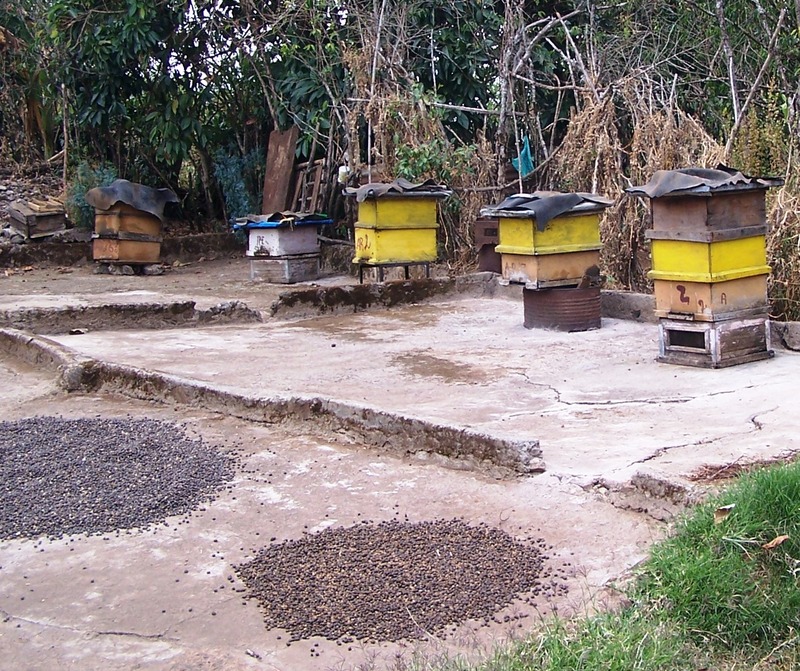 By contrast, beekeeping is a part of many Ethiopian farm families’ endeavors. Honey bees in the US are housed almost exclusively in removable frame hives, mostly of the Langstroth design. A few individuals keep bees in top bar hives or Warre hives. 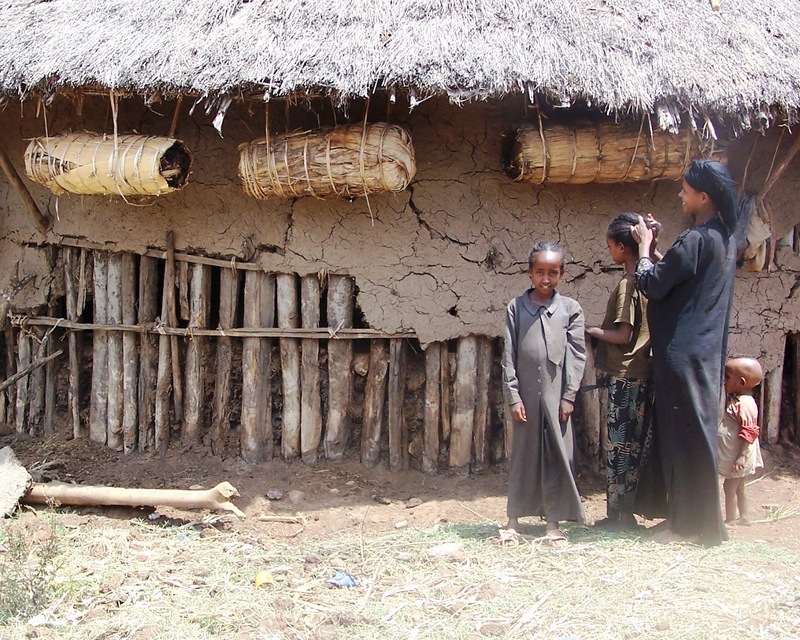 In Ethiopia, modern bee hives are few; some keep bees in mud-coated straw top bar hives, known as transitional hives. However, the vast majority of hives are traditional bee hives which are simple six-foot cylinders made of cane and lined with leaves. Traditional Ethiopian bee hives are placed empty in the forest tree tops with the leaves of the Limich plant used to attract swarms of honey bees. The hive trees are truly beautiful and impressive sights. With woven bee hives mounted among the branches of trees from 50 to 120 feet above the ground, the trees resemble larger-scale versions of native Ethiopian trees covered with weaver bird nests. The keeping of honey bees in Ethiopia involves indigenous knowledge passed down through generations. Nimble two-man teams of beekeepers harvest the hives at night. One barefooted climber with a torch negotiates the tree and gently lowers a hive to his waiting partner. The bees are worked at night because these are the bees with the reputation as the most defensive honey bees in the world. Harvesting the honey is destructive of the nest. Using heavy smoke to drive the bees back, the beekeepers cut combs from the hive. The combs are crushed by hand, and the collected honey and beeswax are sold. The displaced colony of bees flies to another awaiting traditional bee hive. Beekeeping in Ethiopia depends upon colonies regularly swarming. 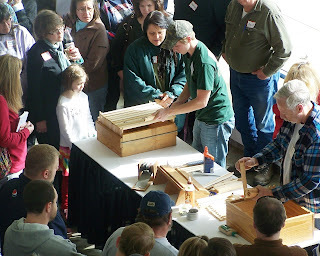 By the time I made my presentation to 150 new beekeepers at the Memphis Area Beekeepers Association’s Forty-Seventh Annual Short Course in Beekeeping, I was already packed for my next assignment. Speaking to the enthusiastic Tennessee, Arkansas, and Mississippi beekeepers about different approaches to keeping colonies healthy, I explained that some beekeepers reacted to the invasion of parasitic mites in the mid-1980s by attempting to kill the pests with chemical miticides. The result of this approach was a temporary control followed by an evolution to a heartier strain of mites resistant to the chemicals. I told the new beekeepers that some individuals took no steps to control the parasitic mites, and that their colonies usually dwindled and died after about two years. I proposed that the beekeepers adopt an Integrated Pest Management approach to beekeeping designed to strengthen the bees and weaken the pests while using a minimum of chemicals in the bee hives. I explained that our goal should be to evolve strains of honey bees that are capable of living in the presence of pests that, once introduced into our area, are surely here to stay. The reception from the audience was positive. Many are entering into beekeeping with a desire to be environmentally responsible, and they seek a way of effectively managing bees without relying upon chemical agents to control honey bee pests. An individually designed IPM plan offers them a workable solution. In today’s photo Adam Power and Sam Mardis demonstrate building bee hive frames. Leaving Memphis’ short course, I turned my attention to my next beekeeping teaching assignment far from home. I had been invited to travel to Africa to train beekeepers in techniques for producing additional products from the bee hive. The voyage would take me to areas I never expected to see. It would provide me with great insights into the capabilities of people who live close to the land and rely upon the honey bee to harvest the resources of the forest.